This paper is being presented in two stages. The first paper will describe a series of observations under the microscope at relatively high power. 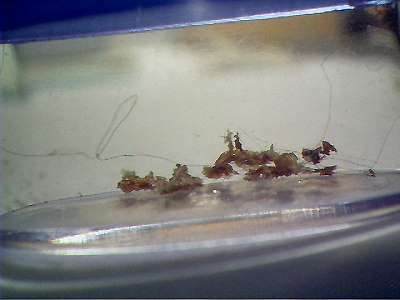 The subject of observation is sample material received from an individual that displays the symptoms of what is now known as Morgellons disease. 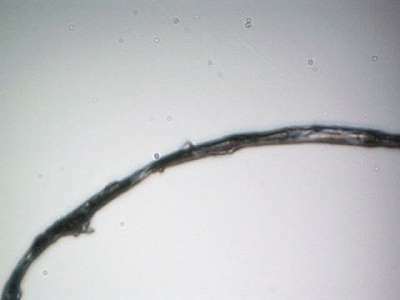 The Morgellons disease is characterized in part by the presence of a host of unusual skin conditions, commonly including persistent lesions and unusual fibers or filaments. The second paper will be commentary on the Morgellons issue from the perspective of this researcher; it will be presented separately at a later date. The illness causes much pain and suffering. The acceptance of the illness by the formal medical community remains controversial, despite increasing and widespread evidence of its existence. 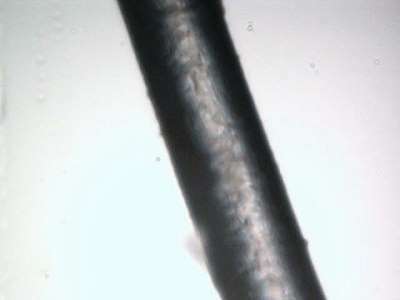 This inquiry is prompted by the finding that despite several years of presumed research on the Morgellons issue, there apparently are no suitably magnified images of the filaments available to the public. Despite recent media attention to the issue, it also appears to be commonly claimed that there are not sufficient resources available to conduct suitable examinations. This presentation will seek to address this problem to the degree possible here. 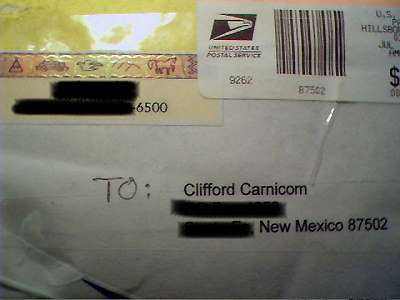 Original Sample Envelope Postmarked Jul 14 2006. Samples are from the subject directly and were sent to me upon my request. Materials were received in mid July after lengthy discussion with the individual. 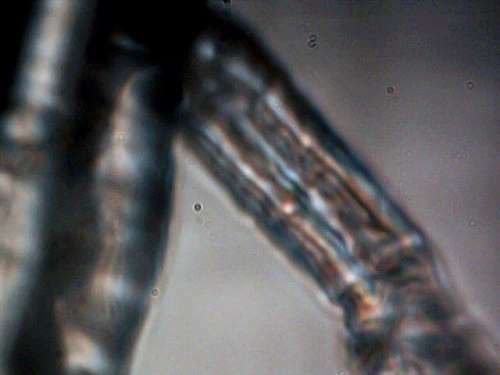 This person has previously made numerous observations and discussions available to the public; photographs were limited to a magnification of 200x by the equipment that was available. I offered to conduct a microscopic study at higher magnification, to photograph the results and to make this information available to the public. This is the primary purpose of this first report; no concerted effort to evaluate the nature of the materials will be made on this page. This page represents several hours of study under the microscope of one portion of one sample, and much more work remains to be done. I may or may not have the means or resources to continue this study and it is questionable that this work should occur under the domain of citizen activism. One of the goals of this paper is to also provide the reader with a sense of scale, and to show a progression from the original materials as they exist from the body to the highest magnification possible with my equipment. The materials received were packaged carefully, thoroughly labeled and in good order. The subject’s description of the physical symptoms encountered are thorough and complete. Any questions put forth to the individual about the illness have been answered in full candor and detail. The subject has provided numerous samples to a medical doctor in the past but no specific response, descriptions, photos or analysis have apparently been provided in return. Detailed information or replies from any formal medical representative, non-profit support or research groups, educational institutions and government agencies appears to be grossly deficient. There appears to be no adequate response to the individual’s many appeals for analysis of the illness symptoms and physical manifestations. The ramifications of a potentially large scale health issue that may be affecting a much larger portion of the population than is currently recognized must be considered. In addition to the suffering that has been endured, those leading individuals that have come forth with their appeals for assistance have in the main been derided, denied or refused. At the very least this group requires our humanitarian compassion and medical assistance. It is also necessary to confront directly the numerous claims of “delusion” that are commonly circulated in conjunction with the public reports on this issue, and to seek out if there are any agendas that may be associated with this characterization of the illness. It must also be asked why the citizenry is in the position of having to provide the information on this page to the public. The question of unknown health risks to the public (and even to this researcher) should be addressed. It is a legitimate question to seek out if these materials are of any unusual form or nature, as this does not appear to be properly and publicly addressed at this point. Adequate images under the microscope may be of help here. One of several original sample materials received in sealed plastic container. Materials photographed prior to handling and observation. Materials stated to come from a lesion on the torso. 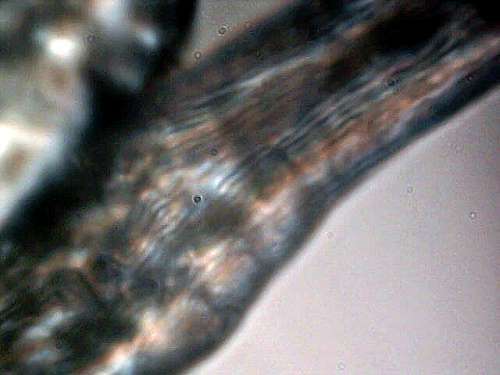 (isolated fibers just visible to the naked eye). This container measures approximately 1 inch (2.5cm) across. Observations to follow are from this sample only. Second photograph of original sample materials received. Additional samples exist for future analysis. 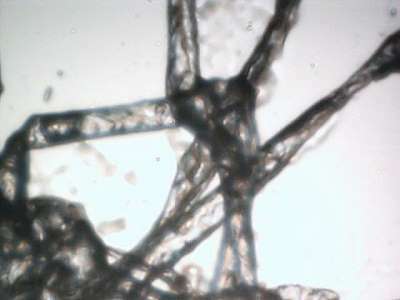 The fibers that are visible and that emanate from the lesion material in the photographs above are the subject of the photographs below. Five magnification levels are available with the equipment being used: approximately 700x, 1400x, 2800x, 5600x and 8600x. Digital magnification of the final image can be increased further if the situation warrants it and if the image quality supports the enlargement. The limit of conventional optical magnification is approximately 2000x. The higher levels shown here have been achieved with the combination of digital camera equipment (primarily astronomic) and a decent optical microscope. 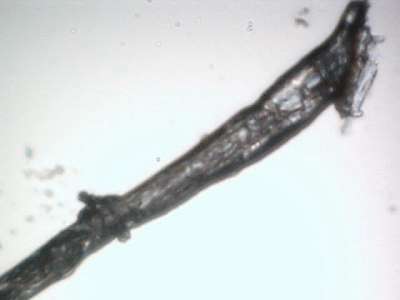 It is believed that these images are the first available publicly that show internal detail of the fibers that are apparently representative of the Morgellons condition. Much deserves to be explained and accounted for with the disclosures that follow, as it becomes quickly evident that these are not typical nor uniform fibers. The first image shown below is at a magnification of approximately 700 times. At the level of 700x, there is relatively little detail that can be seen. The photograph is adequate, however, to obtain a first estimate of its width; this first measurement is approximately 10 to 12 microns. This measurement already seriously calls into question any claim of these fibers being a human hair, as they will measure from approximately 60 to 100 microns in width. The irregular form of the fiber and twisting that is apparent further eliminates any realistic comparison to a human hair. At this point recall that most images that have been made available have been at a level of 200x or less; this already explains why little information about the appearance of the fibers, let alone any internal structure, is available to the public to review. I have encountered two extremely high magnification images taken with an electron microscope, however, it will be seen that no internal detail is available from those images. As there is no commentary associated with those images, there can be no further explanation of that deficiency at this point. Approximate dimension in width : 10-12 microns. No major distinguishing characteristics visible. Indications of some internal structure to fiber may be apparent. Suitable for measurement and comparison to human hair. Some unevenness in size noted and ability of the fiber to fold or twist is visible..
Two different fibers examined; both appear essentially identical at this point. The next presentation will be that of two control photographs for purposes of comparison and to show the capability of the modified microscopy equipment that is being used. THESE ARE FOR CONTROL PURPOSES ONLY AND ARE NOT ASSOCIATED WITH THE SAMPLE MATERIALS IN ANY WAY. 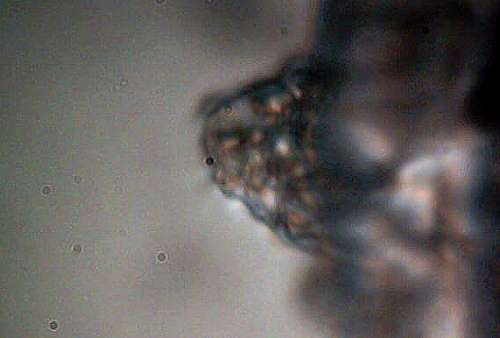 The first photograph will be that of a human hair, also at a magnification of approximately 700 times. The next photograph will be that of a human blood cell at approximately 8600 times; a human blood cell measures on the order of 6-8 microns across. For further comparison, bacteria are commonly on the order of up to 10 microns in size, and viruses are usually 1 micron or less. 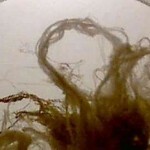 An asbestos fiber is on the order of 2 microns. For further comparisons and extensive fiber studies, please consult some of the earlier work on this site. Note smooth outline and uniform size. Measurement : approximately 65 microns across. No significant internal structure or form apparent. and magnification of the equipment being used in this report. The next set of photographs, the primary focus of this report, will show a series of photographs at 1400x and 5600x levels of magnification. At this stage of the research project, I will largely let the photographs speak for themselves, with minor comments to assist in their interpretation. The next two photographs at 1400x now begin to show some interesting features and form that have not been visible with the initial work. 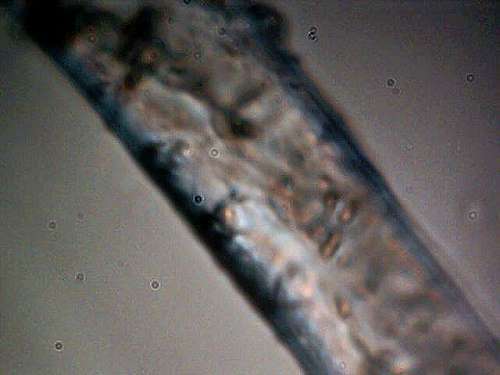 First, it is observed that the fibers have a much more complicated internal structure than was discernible at low magnification. In addition, there is more variance in the dimensions of the fiber than is originally evident. Both of these factors alone begin to seriously question or eliminate claims of commonly known fibers, be they artificial or natural. In the media reports alone, there are now reports of attempted matching of the fiber form using large forensic databases and a complete failure of identification in that attempt. One of the objectives of this report is to allow the public itself to see why that failure is likely occurring. There is a second revelation at this level of magnification and observation. What appears to be a single filament coming from the lesion material is actually much more complicated and that much exists that is not visible to the naked eye. In the second of these two photographs, notice the rather complicated web of numerous fibers. This arrangement was most certainly not visible by eye when this sample was placed under the microscope. It is at this point that much greater interest is to be attached to the identification of these filaments, as well as whatever structures may be contained within. We also notice, particularly in the second photograph of greater translucency, that internal, much smaller structures of elliptical form exist. This begins to strongly suggest a biological nature to the fibers, and a case for ruling out human hairs as well as any common fiber form, natural or artificial, is now made. At this point, it is at least appropriate to address the rather massive efforts that have been and that are being made to characterize this illness as a psychological problem of the afflicted individuals. This effort will be addressed more completely in the commentary section that shall follow at a later time. 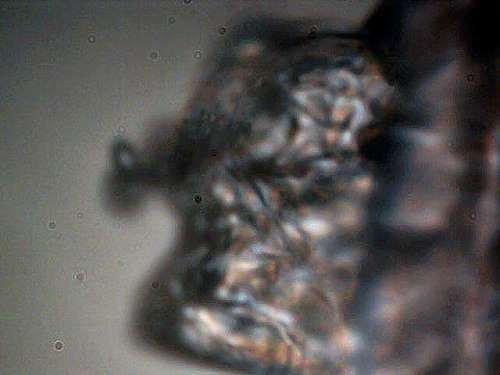 In the interim, however, if the materials being shown here are representative of the Morgellons condition, such efforts to foist a perception of “delusion” upon the public can only be interpreted as a ruse of the highest order in an effort to conceal, deny and avoid the true issues that we are facing. The reports of occurrence of this illness are increasing and they are global at this stage. It is reasonable to inquire as to what agendas may be in place to so forcefully attempt to influence the public perception of this condition or disease. Note variation in fiber form and internal structure becoming evident. Notice irregularities on the surface of the fiber. Notice translucent quality of the fiber. Numerous fibers are now available; this conglomerate not visible to the naked eye. Notice internal structures becoming increasingly visible. Biological natures are more strongly indicated at this point of observation. The next and final set of photographs will be at 5600x. Several important discoveries take place. It is now quite common within certain segments of the primary fiber to find an internal sub-fibrous structure. It can now be seen that what appears to be a single fiber is composed of innumerable sub-fibers, and that these sub-fibers measure at the micron or sub-micron level. There is no known previous disclosure of this fact on the Morgellons condition and a much more complex interpretation of the actual nature of the fibers must now be proposed. Secondly, internal spherical or elliptical structures now appear within the primary fiber, measuring on the order of 1 micron (virus size). It is now a compelling priority to identify these structures and their functions, including the internal micron sized sub-fibers. Notice internal filament structure within the fiber. Width of the internal fibrous structure is at the micron or sub-micron level. Notice internal generally circular structures. Strongly indicative of a biological nature at this point. These structures measure on the order of 1 micron (virus size). Increasingly complex internal nature of the original sample fiber is now evident. The last major discovery by observation at this point is what appears to a “budding” structure of some sort. These structures appear on the edge of the fiber at irregular intervals. These structures contain two further components within. 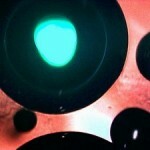 The first of these are spherical or elliptical structures at the micron level within an encasing, translucent shell. 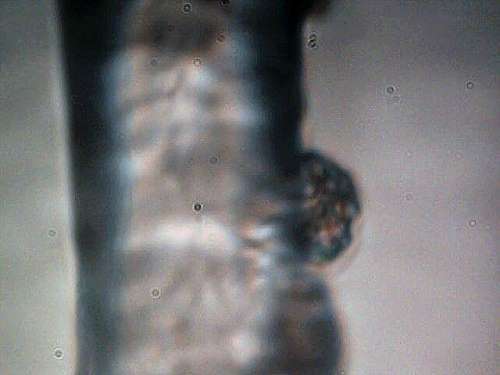 In addition, innumerable fibers at the sub-micron level emerge from the budding structure. The budding structures are highly indicative of a growth or reproductive process, and they may be related to the spread of the disease. “Budding” structures are apparent on the sides of the fiber at occasional locations. The budding structures contain internal structures at the roughly micron or sub-micron size. measuring apparently at the sub-micron level (Limit of equipment reached). Reproduction and growth of the primary fiber structure may be closely linked to these budding structures. The budding structures generally appear to be quite complex in form, structure and organization. Complex internal organization of sub-fibers and structural forms is apparent. This photograph shows the ability of the fiber to be folded and/or twisted. 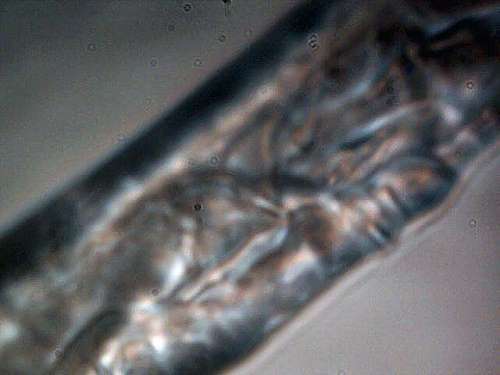 Internal parallel organization of sub-fibers is visible. 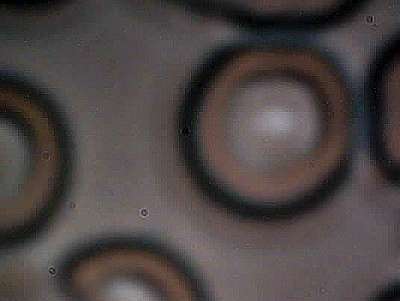 Non-uniformity of the fibers dimensions is also evident. Transverse separation or structure also visible in lower right of image. Additional budding structure visible on the edge of the primary fiber. Complex internal micron size structures within. Translucent encasement that is indicative or suggestive of reproductive capability. The conclusion of this report is necessarily brief at this time. The basic conclusions that can be made are as follows. 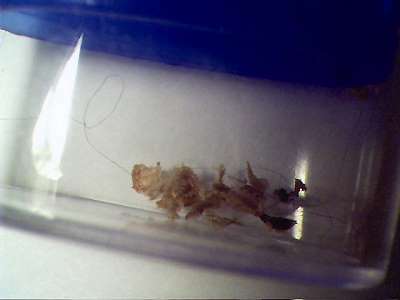 First, there has been a complete failure of the formal medical community, non-profit organizations and government to adequately research and distribute information to the public on the nature of the Morgellons condition. If the samples studied and shown here are in any way representative of the Morgellons disease, they show that any effort to influence the public to accept this evidence as being of psychological origin or as insignificant are disingenuous at the highest level. Any motive of secrecy and or misinformation is to be confronted directly and disclosed. The so-called efforts at research by various organizations, including non-profit, university and government are to be called into question; there is a serious lack of informing the public as to the basic nature of the condition. No citizen should be assuming the risk of attempting to identify the nature of this illness. The traditional medical community and government health organizations have already displayed an appalling failure of addressing the urgency of this matter. I call upon all of those individuals or groups with the proper resources to strike to the core of this issue as quickly as possible, and to disclose all results of the findings to the public as they occur. Additional research and or information from other sources will be linked into this report as it becomes available. Additional commentary of the general state of findings on the Morgellons issue will be presented at a later date. The results of this report are of a preliminary nature, and they are restricted to the materials that have been provided by a single individual.